HASTEN can be used successfully in GLYPHOSATE mixes especially where the mixing partner is usually recommended for use with HASTEN. The following examples come from larger studies undertaken by Conservation Farmers Inc. and published in The 2nd Fallow Weed Management Guide. HASTEN spray adjuvant is a blend of esterified vegetable oil and non-ionic surfactants that has : Proven cost effective performance for over 10 years with a wide range of agricultural products, Excellent plant and insect penetrating and wetting properties, An internationally recognised tradename and reputation for reliability, Approval by Environmental Protection Agencies in many countries including the USA, Renewable material – Vegetable oil – as its base raw material, A high quality formulation providing easy dispersion and stable emulsion characteristics, and International Patents granted and pending. HASTEN is a unique spray adjuvant that has been designed to improve the efficacy of a wide range of agricultural products including; Herbicides (selective and non-selective), Insecticides, Fungicides and Defoliants. 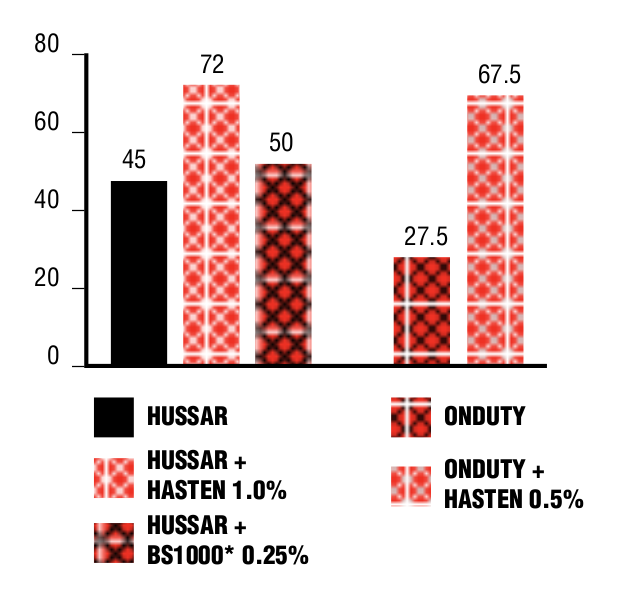 When HASTEN is tank mixed with certain post-emergent herbicide products and applied in the field, the non-ionic surfactants in the HASTEN formulation help to retain spray droplets and ensure thorough coverage of plant surfaces. The esterified oil in the HASTEN formulation will retard crystallization of herbicides as water evaporates from spray droplets. It will also increase the penetration of herbicides through a plant’s epicuticular waxy surface leading to enhanced weed control. It is this dual action of surfactant and esterified oil which makes HASTEN a very effective adjuvant with many post-emergent Herbicides. HASTEN is primarily used as a tank mix adjuvant, that is, the herbicide and HASTEN are added separately to the spray tank. This provides the greatest flexibility for matching the use rate of HASTEN with the situation at hand eg. environmental conditions, weed types, spray equipment etc. HASTEN can also be formulated directly with Herbicide formulations where market conditions make this preferable. HASTEN is a non-ionic formulation which makes it compatible with most herbicides. In fact, HASTEN has been in use for over 10 years with many herbicides around the world and has been found to be physically compatible with major herbicide products. HASTEN has been tested and evaluated by universities, lifescience companies, research organizations and independent researchers for many years. It has been established that HASTEN is a very effective adjuvant for improving the performance of herbicides and in many situations will outperform both emulsified petroleum and vegetable oil based products. It has also been observed that HASTEN is capable of increasing the activity of certain herbicides which may result in crop injury. Therefore in all new situations it is important to test HASTEN with the herbicide in a small area prior to applying it on a commercial scale. HASTEN is successfully used by farmers in many different countries around the world with a diverse range of agricultural products including herbicides. In Australia, HASTEN was commercialized in 1996 and is now recognised as a leading adjuvant by farmers, distributors and lifescience companies. After extensive testing many lifescience companies, including BASF, BAYER, DOW, DUPONT, SUMITOMO and SYNGENTA have endorsed and recommend the use of HASTEN on some of their herbicide labels. A list covering the use of these herbicides in Australia is provided as Table 1. HASTEN may be used in place of non-ionic surfactants or crop oil concentrates when permitted by herbicide labels. Typically, HASTEN is added to the spray tank at a concentration of 0.5-1.0% when spray volumes are between 50-100 Litres per hectare. In situations where the agricultural practice is to use a higher volume than 100 Litres per hectare, HASTEN is typically used at 0.5-1.0 Litres per hectare. Trial 1 Notes: Weed control was observed to be less effective and much slower than normal due to unseasonally dry conditions. However the benefits of using HASTEN were evident. 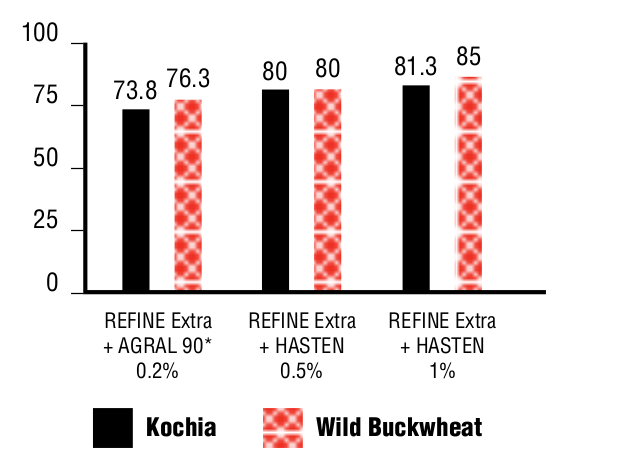 Trial 2 Notes: HASTEN was found to be a superior adjuvant to AGRAL 90 when used with REFINE EXTRA for the weeds shown. 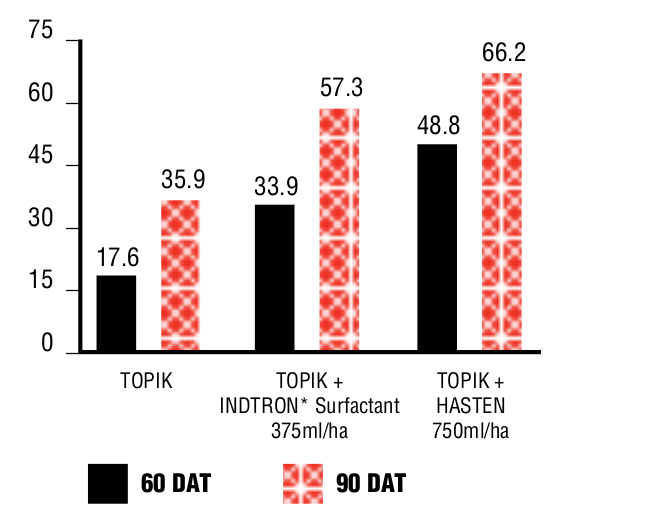 Trial 3 Notes: HASTEN enhanced the weed control significantly when applied with TOPIK at the sub-lethal dose of 30g/ha. Copyright © 2011 Victorian Chemical Company Pty Ltd. All rights reserved.